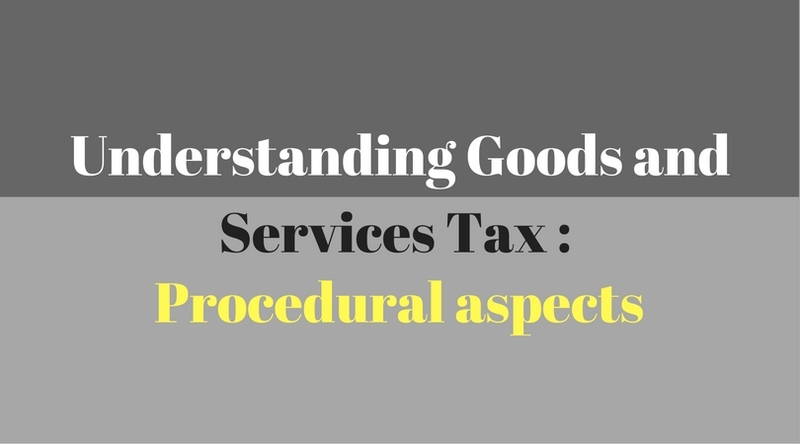 In continuation of our previous post on GST, we are presenting details on procedural aspects under GST law in this article. You can refer our Article “Understanding Goods and Services (GST)” to understand the salient features of GST and the liability to pay thereunder. Registration is essential to provide a kind of legality to the business being carried on. 3. Supply consists of Intra State supply exceeding 9 Lakhs Yes. Refer Note • Note 1. • If entire supply comprises of exempted supply, registration is not required. 5. Supply consists of Intra-State supply [+] Inter-state exempted supply and that exceeds 9 Lakhs Yes. Refer Note • Note 1. For NE and hill States, the limit is 4 lakhs. Aggregate turnover exclude taxes viz.GST. Aggregate turnover does not include value of supplies on which tax is levied on reverse charge basis, and value of inward supplies. 2. Registration must be taken within thirty days from the date on which the person becomes liable to registration. Application for registration is to be made in Form GST REG-01. No fee is payable for filing application for registration. 3. Separate registration is required for each state where a person has a business operation and liable to pay GST. 4. Separate registration may be obtained for each business vertical in same state subject to conditions prescribed. 5. Voluntary registration is permissible. 6. PAN is mandatory for registration. 7. Application for registration has to be digitally signed in case of Private Company, Public Limited Company, Public Sector Undertaking, Unlimited Company, LLP, Foreign Company, Foreign LLP . 8. After successful registration, a 15-digit registration number will be issued called GSTIN. 9. Registration Certificate is granted in GST REG-06 Form. Registration Certificate once granted is permanent unless surrendered, cancelled, suspended or revoked. All assessees or dealers who are already registered under existing central excise/service tax/ vat laws will not have to obtain fresh registration under GST. All such assessees/dealers shall be migrated to the GSTN network and shall be issued GSTIN number and password. They will be asked to submit all requisite documents and information required for registration in a prescribed period of time. Failure to do so will result in cancellation of GSTIN number. Since separate registration is required for each state of operation, the service tax assessees having centralized registration will have to apply afresh in the respective states wherever they have their businesses. 1. At the time of supply of goods and services, a tax invoice is to be issued. 2. For those suppliers supplying non taxable goods or services or those under composition levy, a bill of supply to be issued. 3. Invoice for services to be issued within 30 days (45 days in case of banking industry) from date of supply of service. xvii. signature or digital signature of the supplier or his authorized representative. 5. The invoice shall be prepared in triplicate in case of supply of goods and in duplidate in case of supply of services. 6. Credit notes or debit notes can be issued till September following the financial year in which related supply is made or filing of annual return whichever is earlier. 7. Option has been given to revise the invoice issued prior to date of granting registration where the effective date for registration is before the registration certificate date. 1. GST payment has to be made at the time of supply of goods and/or services. The supplier can utilise the input tax credit and discharge the remaining liability. 2. Form GST PMT 4 is the challan for depositing GST. 3. Tax payment is to be done monthly basis by the 20th of the succeeding month. 4. Composition tax payers will need to pay tax on quarterly basis. 5. Timing of payment will be from 0000 Hrs to 2000 Hrs. D. Over the Counter payment (OTC) through authorized banks for deposits up to ten thousand rupees per challan per tax period, by cash, cheque or demand draft subject to few exceptions. 7. Date of credit to the Government account shall be considered as date of deposit for tax dues. 8. On successful credit of the amount to the concerned government account maintained in the authorised bank, a Challan Identification Number (CIN) will be generated by the collecting Bank and the same shall be indicated in the challan. 9. In case of default in payment of tax, interest is payable. 1. Every registered taxable person who crosses the threshold limit for payment of taxes needs to file i.e. 20 lakhs. 2. Apart from them, categories of suppliers who are mandatorily required to register, need to file. 3. Return may be filed electronically through the Common Portal, either directly or from a Facilitation Centre, notified by the Board or Commissioner. 5. GSTR-5 Return for Non-Resident foreign taxable person 20th of the following month or within seven days after the last day of the validity period of registration, whichever is earlier. 6. GSTR-6 Input Service Distributor return Monthly, 13th of the following month. 9. GSTR-9 Annual Return 31st December following the end of the FY. 10. GSTR-9A Simplified Annual return by Compounding taxable persons registered under section 8 31st December following the end of the FY. 11. GSTR-9B Reconciliation Statement 31st December following the end of the FY. 7. For B2B supplies, all invoices, whether Intra-state or Interstate supplies, will have to be uploaded to facilitate invoice matching aimed to verify the ITC taken by recipient. 8. If invoices in GSTR-2 do not match with invoices in counter-party GSTR-1, the Input tax credit will be reversed if the mismatch continues even after it is made known to both and still it is not rectified. 10. Return for subsequent tax period is not allowed to be filed unless return for previous period is filed. 11. A return filed without payment of self assessed tax therein shall be treated as invalid return. 12. Return to be furnished even if no supply effected during the said tax period. 13. A registered taxable person who files return beyond the prescribed date will have to pay late fees of rupees one hundred for every day of delay subject to a maximum of Rs 5,000. 14. Return once filed cannot be revised. However, the system will allow changing the details of those transactions (invoices or debit/credit notes) that are required to be amended. They can be amended in any of the future GSTR- 1/2 in the tables specifically provided for the purposes of amending previously declared details. 15. There may be a time gap between the date on which a person becomes liable to registration till the time the registration is granted. For that time, a first return is to be submitted containing details of outward and inward supplies. input tax credit accumulated on account of inverted duty structure. 2. For claiming refund of any excess balance lying in the electronic cash ledger, no separate refund application is required. Submission of Part B of GSTR 3 in which the refund has been claimed shall be deemed to be an application filed for refund. 3. For other cases, the person concerned is required to file the refund application (GST RFD-01) before expiry of two years from the relevant date, as given in the explanation to section 38 of MGL. 5. Application may be filed electronically through the Common Portal either directly or from a Facilitation Centre, notified by the Board or Commissioner. 6. In case of deficiency found in refund application, the proper officer shall issue RFD 03 and thereafter the taxpayer has to file a fresh refund application after completing the deficiencies. 7. A Certificate in Annex 2 of FORM GST RFD-1 issued by a Chartered Accountant or a Cost Accountant is to be attached to the effect that the incidence of tax and interest claimed as refund has not been passed on to any other person, in a case where the amount of refund claimed is five lakh rupees or more. 8. Principle of unjust enrichment applies to the refunds except in cases of actual export and unutilsed ITC. 9. No refund shall be granted if the amount is less that Rs.1000/-. 10. The time limit for granting refunds has been fixed at 90 days of submission of application. The above article has been prepared based on “FAQs on GST” by NACEN as well as draft GST rules available in public domain. We have attached a copy of compiled FAQs here to be serve as quick handout. Coming ahead are posts on other GST topics. Stay updated. Post in your queries if any. Also let us know if you encounter any error or omission to help us improve.